Actually this Kata are excluded of the system Uechi-Ryu. The master Kanbun Uechi demonstrated rarely in the first Dojo of Wakayama (center of Japan). 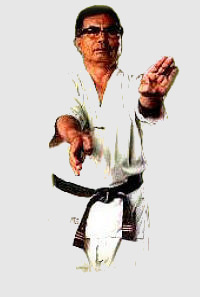 Palinpe is the old version of Superinpei, and as in other classical Katas are used mainly the techniques of open hand and are not repeated the same movements in the four directions as in modern Superinpei. The tradition affirms that Kanbun Sensei called of abbreviate form �gShinpe�h or �gShinpa�h depending on the person who heard it. Kenwa Mabuni (Founder of the style Shito-ryu) visited Kanbun Uechi in Wakayama at the beginning of 20th century and after this visit he inspired in a Kata named �gShinpa�h. There are clear indications exists that Kanbun Sensei influenced him with demonstrations of Katas including Palinpe.